Eastern catcher Kelsey Roberts throws out a runner at first base, during the Lady Eagles’ 7-5 extra innings loss to Valley on Thursday in Rio Grande, Ohio. 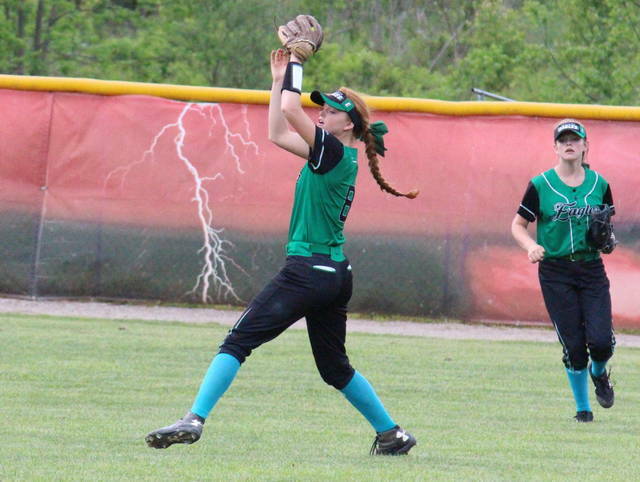 Eastern freshman Kennadi Rockhold catches a flyball in right field, during the Lady Eagles’ 7-5 loss to Valley on Thursday in Rio Grande, Ohio. RIO GRANDE, Ohio — Two games rolled into one. 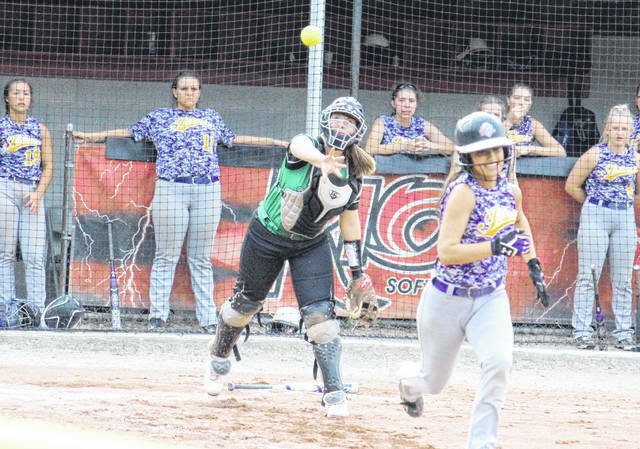 After seven innings of play in Thursday’s Division IV softball district semifinal in Gallia County, top-seeded Eastern and fifth-seeded Lucasville Valley were tied at one and locked in a pitcher’s duel. The teams played evenly for another seven innings as a slugfest broke out, and the score was tied at five through 14 innings. 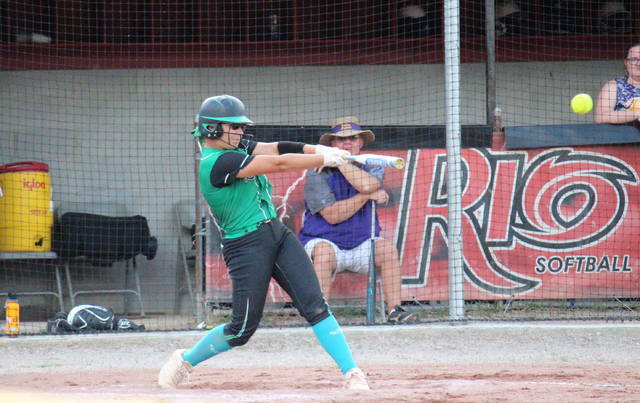 The Lady Indians scored twice in the top of the 15th inning and the Lady Eagles failed to answer for the first time, giving Valley the 7-5 victory. The Lady Indians opened the game with a triple, but the Lady Eagles (17-7) escaped the inning unscathed. Valley stranded runners on second base in the second and third innings, but failed to break through in either frame. After leaving a runner on first in the opening inning, Eastern began the bottom of the second with three straight hits. The next three Lady Eagles were put away in order, with back-to-back strikeouts and a flyout ended the inning. EHS broke the scoreless tie in the bottom of the third, as Cera Grueser led the inning off with a single, moved to second on a wild pitch, made it to third on a groundout, and then came home on a two-out Tessa Rockhold single. However, Eastern was held to just one hit over the next two innings. After back-to-back hitless innings, the the Lady Indians tied the game at one in the top of the sixth, when Madison Williams scored on a two-out single by Kirbi Sommers. 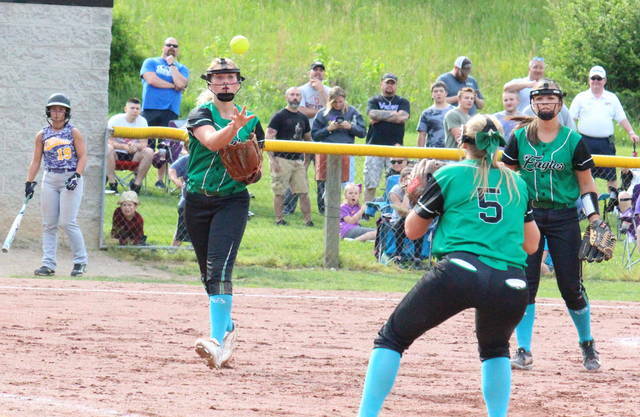 The Lady Eagles singled once in the bottom of the sixth, and VHS had a single in the top of the seventh, but neither team could break through. EHS was retired in order in the seventh, eighth and ninth innings, with Valley being retired in order in the eighth and being held to a single in the ninth. In the top of the 10th inning, Valley broke the 1-1 tie, as Margie Caldwell doubled home Brooklyn Weeks. With two outs in the inning, Sommers singled home Caldwell and Madison Kuhn, giving the Purple and Gold a 4-1 lead. In the bottom of the inning, Ally Barber reached on an error to open frame, and then Kelsey Casto and Kennadi Rockhold hit back to back singles to load the bases. Barber scored as Mollie Maxon was hit by a pitch, and then Sidney Cook singled home Casto and Kennadi Rockhold, tying the game at four. Eastern left two runners in scoring position, and the teams continued to battle. After blanking the Lady Indians in the top of the 11th, Eastern began the bottom of the frame with back-to-back hits, but ultimately stranded both runners. Valley loaded the bases with two outs in the 12th, but a groundout ended the inning. In the home half of the frame, Cook doubled with one out, but was left on base. Eastern sent VHS down in order in the top of the 13th, and again began the bottom of the frame with back-to-back singles. However, the next three Lady Eagles were retired. In the top of the 14th, Valley took a 5-4 lead as Caldwell scored on a two-out single by Kensie Spencer. Eastern tied the game in the home half of the inning, as Grueser led off with a double and then scored on a one-out error. The Lady Indians reestablished the lead in the following frame, as Caldwell and Haylee Stone scored on a two-out single by Marissa Markins. The Lady Eagles had a pair of hits with one out in the bottom of the 15th, but couldn’t bring either around to score and fell by a 7-5 final. Following the marathon game, fifth-year Eastern head coach Bryan Durst reflected on the opportunities for both sides. “Just a tremendous game, there’s so many different ways the outcome could have been different,” Coach Durst said. “You look at the way we had the lead early, then in extra innings they go up three, and I thought ‘our chances are not good here,’ but we just kept battling. We got right back in it, they got another lead and we battled back again. Pitching all-15 innings and suffering the loss in the record book for the Lady Eagles, freshman Tessa Rockhold struck out 10 batters and allowed seven earned runs on 18 hits and five walks. “I thought Tessa being a freshman out on the mound, what she did tonight was awesome,” Coach Durst said. Taking the win in a complete game for Valley, Faith Brown struck out seven batters, while allowing five runs, three earned, on 18 hits, a walk and a hit batter. 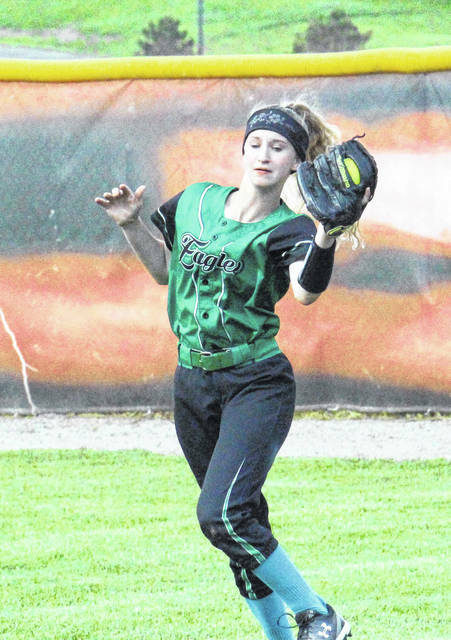 The Lady Eagles — playing without starting left fielder Courtney Fitzgerald, who missed the game due to illness — had eight players combine for 18 hits, 16 of which were singles. Leading EHS, Cook was 3-for-7 with a double and two RBIs, while Barber and Kennadi Rockhold were both 3-for-7 with a run apiece. Emmalea Durst also went 3-for-7 in the setback, Grueser was 2-for-7 with a double and two runs, while Tessa Rockhold was 2-for-7 with an RBI. Maxon and Casto both singled once, with Maxon earning an RBI, and Casto scoring one run. Leading Valley, Caldwell had a triple, two doubles, two singles, three runs and one RBI, while Brown singled four times and drove in two runs. Williams and Weeks both singled twice and scored once, while Sommers singled twice and drove in a run. The Lady Indians committed four errors in the game, one more than the Lady Eagles. EHS stranded 17 runners on base, while VHS left 14. This marks the final game for the Lady Eagles’ senior trio of Sidney Cook, Sophie Carleton and Courtney Fitzgerald. With only losing three seniors, the Tri-Valley Conference Hocking Division champion Lady Eagles will look to continue their winning tradition in the future. Valley is scheduled to return to Rio Grande on Saturday at 1 p.m. to face the winner of the Southern versus Notre Dame game, which was suspended in the fifth inning due to darkness, with the Lady Titans ahead 5-0.